Posted on July 24, 2016 July 24, 2016 by KeithGPosted in Model SpotlightTagged Anime, BrickCon2007, Convention, Manga, Mazinga, Mazinger Z, Mecha, Nostalgia, Sandlin, Sci-Fi, Shogun Warriors, Toys. fantastic stuff, an you know the blog is good ehen u walk away with a new great builder to follow on flickr. (Sandlin). Thx for that. 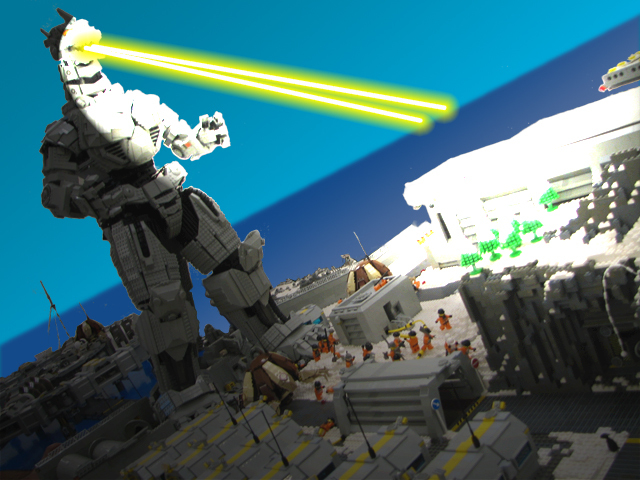 Man i miss thoses days of star wars an mechs. That’s a great compliment, thanks Mike! Sandlin’s Asmodeus is one of my favorite ships of all time. To go even more meta, my teknomeka photo above is a version of the character Ultra V from the PS2 game, War of the Monsters. 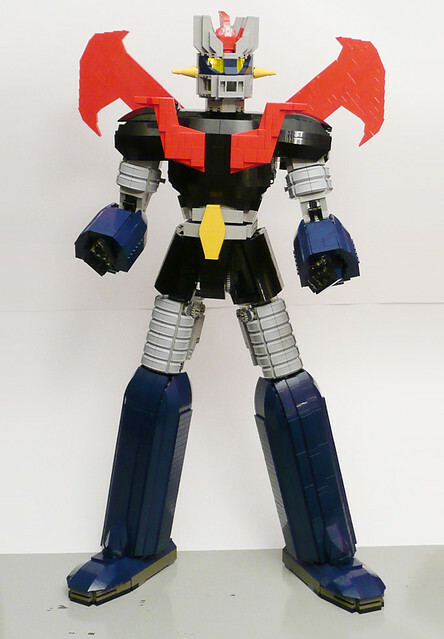 Ultra V is still an homage to Mazinga, and later on I converted the MOC into an actual Mazinga. So many layers…like an onion made out of LEGO. Cheers Sandlin, it’s good to talk to you again. I hope to make it to BrickCon this year too and we’ll have to get a beer. Yeah man, I’m going this year. Hope to see you there. I was never into anything mech-related when I was a kid, so I don’t have nostalgia for this type of thing. But I love the toy-like primary colors on Orion and the dark background makes them pop even more. I think my biggest issue with Icarus is the black lines with white and red color blocking all over. It looks like the Partridge Family bus was actually an Autobot. The Mondrian Warrior. 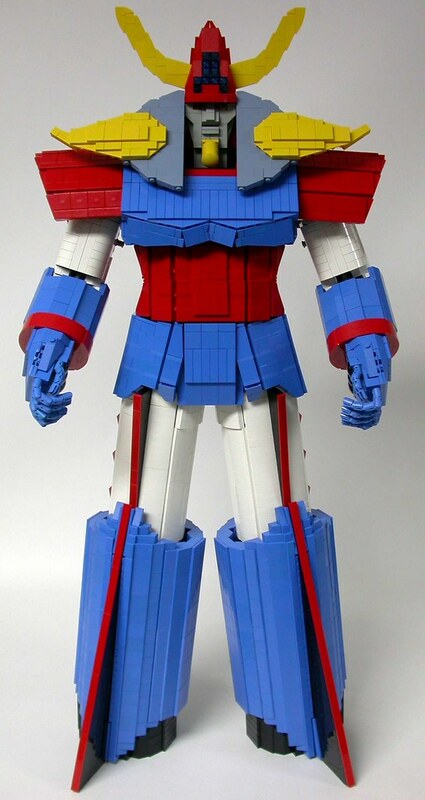 I remember trying to build things like this back in the mid-eighties with the LEGO of the time, and being very unsuccessful at recreating the Shogun Warrior look or even the Robotech compactness. Still tried and really appreciate that these lovely guys are more plausible and playable nowadays. But it really wouldn’t be a Shogun Warrior unless several rocket fingers were lost somewhere in the yard. Ah, apropos! Keith is always going on about his rocket fingers! Very cool to see both Sandlin’s and Cooper’s stuff in this post! I have met both and consider them to be two titans of the hobby who are every bit as powerful as builders as the mega-zegga-boom-boom robots they build. A 3vill and Meca-Godzilla combo for lunch. I still recall the “war heads” carried in the weapons bay of the Azmodeus. Excellent stuff! Partridge Family Autobot…now I can’t unsee it. Where is Ruben Kinkaid? I lost all my rockets for Mazinga, then the other Shogun Warriors mocked him relentlessly. It completely ruined our friendship. No love for my Raideen? *sniff sniff* You don’t love me anymore! Damn it! I always forget something, I shall add mighty Raideen to the post, better late than never. I hope he doesn’t kill me for such a slight. a quick shout out and say I genuinely enjoy reading through our posts. the same subjects? Thanks ffor you time! WOW if I could afford all those tiles…..